The rapid advance in technologies in recent years has provided casino players with the wonderful opportunity to engage in a wide range of premium-quality classic table games as well as an impressive variety of online slots at all times, from the comfort of their surroundings via their portable devices. Both software suppliers and online casinos strive to meet the ever-increasing demand for quality mobile slots that run seamlessly on Android-based smartphones and tablets. All well-known casino operators have gone mobile, so the only difficulty Android users are facing with is choosing which casino to register and play at on the go. What is more, the number of Android-friendly slots is on the increase as software developers adapt more and more titles for mobile play. For the most part, playing slots on Android devices resembles closely playing them on your desktop computer or laptop so if you have ever spun the reels online, the transition from desktop to mobile play will be quite easy. What is more, players who have already opened an account at an online casino will not be required to register again in order to play on the move. They can log in via their Android devices by using their existing credentials. When it comes to mobile play, both iOS and Android users are facing two options. Many reputable online casinos offer native Android applications which can be downloaded and installed by their registered customers free of charge. However, due to Google’s policy of prohibiting real-money gambling apps, the downloadable applications of most casino operators are inaccessible through the official Google Play Store. Players can download the native Android apps directly from the casinos’ websites by scanning the QR codes or by requesting a download link to be sent via email or text message. The apps are easy and quick to install, so there is no need to worry about the installation process. 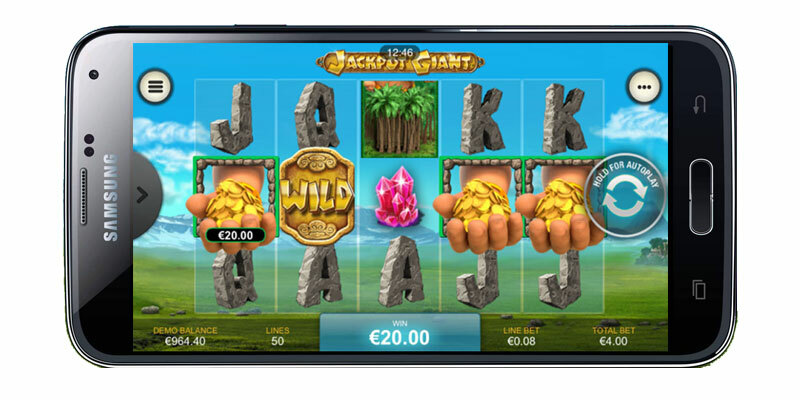 Players, who do not wish to download and install any dedicated apps or simply lack memory space on their Android devices, will still be able to enjoy a variety of quality slots on the go since all well-known online casinos in the industry are mobile-friendly. The only thing players need to do is type the casino’s address in the address bar of their phones’ browsers. Then, they will be automatically redirected to the mobile-friendly version of their online casino of choice. There is the option to play the selected mobile slots for real money or test their Flash versions in Practice mode. However, before you proceed to load your favourite Android-friendly slots to play on the move, you should make sure you have a reliable WiFi connection as otherwise, you are likely to experience freezes and lags, which will spoil your experience. On that note, it is worth mentioning that mobile slots are not that demanding when it comes to bandwidth because in many cases, the graphics in the background are stationary. Players, who experience difficulties in running the Android slots smoothly, should consider closing other open applications that are using memory and cache space. Slot fans will enjoy a quality gaming experience as long as their Android device runs on OS 2.3.3 (or over) and their display is at least a 16-bit one. As soon as you load your preferred Android-friendly slot, you will surely notice playing on the go is much more interactive and stimulating, which can be explained with the greater responsiveness of the touch screen devices. Also, the graphics and animations will appear crisper and brighter because of the higher resolution of Android devices’ screens. As far as security is concerned, slot fans can rest assured playing for real money via their Android-based smartphones or tablets is just as safe as enjoying the slots on their desktop computer or laptop. What is more, many experienced players believe playing via Android devices offers a greater level of security because they are less susceptible to fraudulent activities and hacking. Additionally, all legitimate mobile-responsive casinos take special measures and use tough-to-crack encryptions to protect their player-base from identity thefts, misappropriation, and frauds. If we have to be honest, Android users exceed in number the owners of iOS-based devices, so it is hardly surprising there is a great variety of Android-friendly slot titles to choose from. Since the diversity slot fans are faced with is indeed impressive, we have attempted to sift out some of the most popular slot titles that are available for Android play. Playtech’s Jackpot Giant has earned the reputation of one of the most popular titles on the catalogues of the online casinos. This immense popularity hardly comes as a surprise because this five-reel slot with its 50 paylines is linked to a colossal progressive jackpot that increases by the minute. Playtech has indeed invested a good deal of effort to render the game as visually appealing as possible. This becomes evident the very moment the slot loads as its engaging intro comes nothing short of what one would expect to see in a Pixar animated film. Yet, Jackpot Giant has much more to offer than crystal clear graphics and amazing animations. The game is loaded with fantastic features that can help players bag greater cash rewards. These include stacked wilds, scatters, and the Giant Bonus game. The jackpot is to be won by the lucky player, who manages to line up five wild symbols on payline number 1. Those, who bet the maximum amount on all 50 lines, have greater chances of triggering the giant prize. 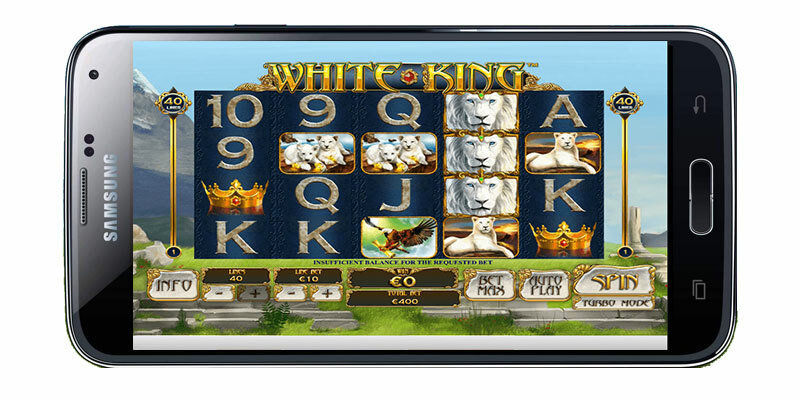 Leading gambling software supplier Playtech appears to be committed to the needs of Android users as it has adapted its thrilling White King slot for mobile devices that run on the widespread OS. The game features a majestic white lion that also plays the role of a stacked wild symbol and can substitute for all other symbols with the exception of the White King Logo scatter. Other high-paying symbols players will encounter on the reels include a golden crown, a white lioness, two white lion cubs and an eagle. White King is played on the standard five reels and has a total of 40 paylines. The good news is these are not fixed, so players get to adjust the number of lines they wish to bet on. The maximum bet amount stands at £2,000, with coin values ranging between £0.01 and £50.00. The White Lion Logo scatter is among the most desirable symbols in the game – land three of those on the second, third and fourth reels simultaneously and you will be awarded 5 free spins. What is more important, the scatters do not necessarily have to align on an active payline for players to receive the bonus spins. The game is available for mobile play at the Eurogrand Casino. Slot fans who are looking to “embark on an epic journey” via their Android-based devices should definitely give Kong: The 8th Wonder of the World a try. This is yet another Playtech creation which impresses with unparalleled graphics, imposing sound effects and lucrative features. This five-reel masterpiece with 20 adjustable paylines is based on Peter Jackson’s 2005 epic adventure film. The game starts with a nice intro that uses footage from Jackson’s iconic film and utilises its main characters as symbols on the reels. The game can be played in two modes – the Jungle mode and the Big City mode. The symbols in the two modes change visually, but the winning combinations in the paytable remain the same. 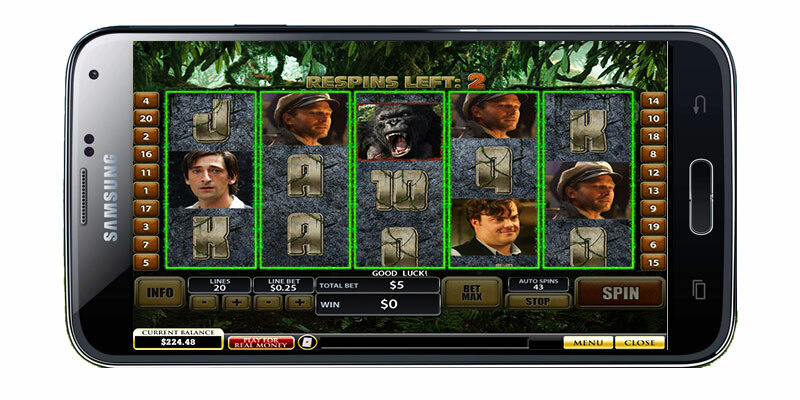 Three Kong wild symbols anywhere on the reels will reward players with 3 free re-spins. In addition, Kong has two interesting bonus games to offer. In the Skull Island Bonus feature, players are required to play a “pick me” game and match three identical creatures on a jungle map to earn monetary prizes and unlock the Big City mode. The latter offers yet another mini game, the City Tower Bonus, where players should pick one out of three planes to take down and help Kong. Each of the planes carries a cash prize of a different value. Gold Rally is among the older Playtech creations as it was originally released in 2004. Nevertheless, the fact players prefer it over new titles to this day serves to indicate this three-reel slot with 8 paylines definitely does not lack in staying power. The slot’s theme revolves around mining for gold, so some of the symbols it includes are dynamite, lanterns, a pickaxe and scales. Do not let the fact the game is played on three reels fool you. 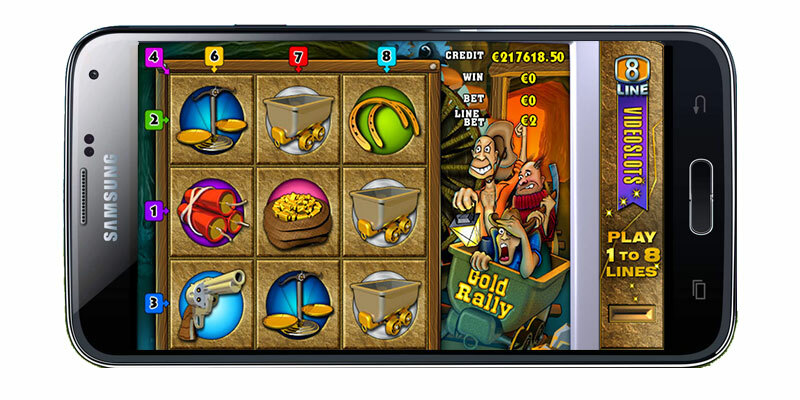 For a three-reel slot, Gold Rally comes with some useful features including Autoplay, a scatter symbol and a bonus game. The latter is unlocked when players succeed in lining up the dynamite symbols in all four corners of the reels’ grid. Once the bonus game is triggered, players will be able to earn monetary prizes by blowing things up. Being one of the most well-known titles in Playtech’s gaming catalogue, Gold Rally has been adapted for all mobile devices one could possibly think of, including iPhones and iPads, Blackberries, Windows Phones and of course, Android-based smartphones and tablets. Last but not least, Gold Rally has a massive progressive jackpot that all slot fans covet. The pool for the pot starts at £75,000 and the greatest sum it has escalated to stands at £3.9 million. The progressive jackpot is awarded to the lucky player, who succeeds to cover the entire reel grid with scatter symbols. 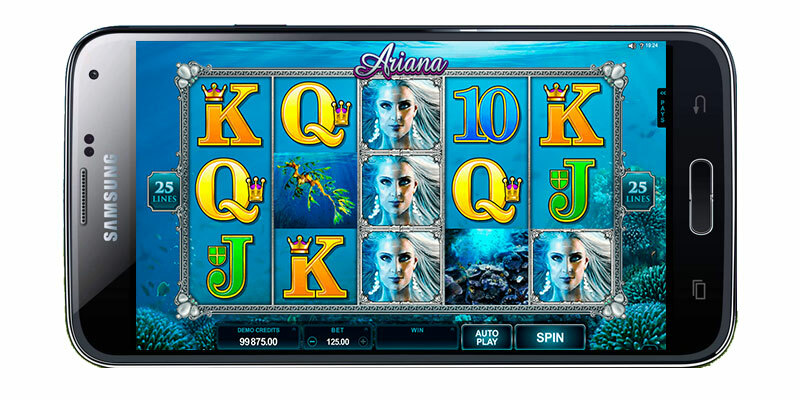 Android users have industry frontrunner Microgaming to thank for the vibrant slot that is Ariana. The game features five reels with 25 paylines and takes players on a deep-sea adventure. If you are wondering who Ariana is, she is a mermaid princess and can make an appearance on all reels as a stacked symbol to help players form more winning combinations. The remaining high-paying symbols in the game, including the seaweed, the coral reef and the treasure chest, can potentially be stacked on the first reel. This causes the matching symbols to expand and fill their respective reels completely. We need not say this is among the most lucrative features in the game. The starfish is the scatter of the slot. Land three or more of those on the reels and you will trigger a round of 15 free spins. The Ariana Logo functions as a wild symbol and can substitute all symbols with the exception of the starfish. With a maximum prize of 12,500 coins, Ariana is definitely worth your while.